Annah Chakola’s family has been in the Indian textile business for over a century and a half, so to say working with fabric is in her blood wouldn’t be that far of a reach. After years of witnessing beautiful fabrics ends and threads going to waste, Annah decided to turn one man’s trash into another woman’s treasure. 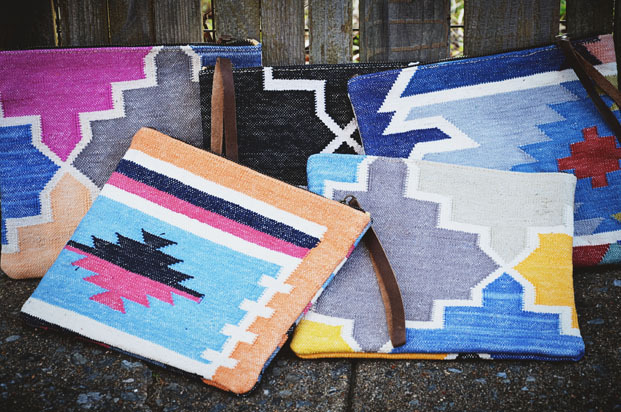 Each piece that Annah designs for Boho Gypsy’s recycled fabric collection is carefully handcrafted by a registered Global Fair Trade women’s collective in Northern India. She’s forged relationships with many similar initiatives around the globe to help bring her designs to fruition. Supporting other mom and pop shops — no matter where they are — is important to this conscientious entrepreneur. Slouchy, super soft handcrafted artisan leather tote with a beautiful finish that will only get better with age. Exterior leather open pocket, and one inner pocket. Naked leather interior.